Even as a patient organisation, we’ve heard enough healthcare professionals talking in stressed and worried tones about their upcoming CQC inspection to know this was an area of concern for many hospital staff. It was of great interest, therefore, when Dr. Sanjay Krishnamoorthy from the CQC came to a recent meeting of the NHS England Adult Critical Care clinical reference group meeting. His talk was engaging, informative and very positive, particularly from a patient perspective. Dr. Krishnamoorthy began by explaining that the new style of CQC inspection began in September 2013. To a large extent, the changes were a result of Sir Robert Francis QC’s report into care at the Mid Staffordshire Foundation Trust, which called for more robust and patient focused hospital inspections. Each core service is rated against each domain on a four point scale of Outstanding, Good, Requires Improvement or Inadequate. Larger teams (typically 30 or more) inspect hospitals over a week with both announced and unannounced components to the inspection. Expert clinicians and patients are pivotal members of the team in providing peer-to-peer review of services inspected. 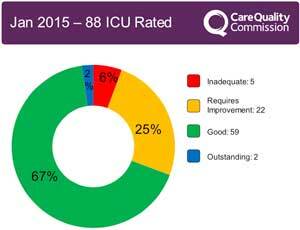 Under the new inspection methodology, the CQC has rated 88 Critical Care units up to January 2015. A majority of units (67%) were rated as good, with 2 units rated outstanding and 5 rated inadequate. These ratings in comparison with the hospital areas showed critical care to be a top performing core service across UK hospitals. Inspections have found that a strong focus on patient safety and robust leadership structures are key features of good critical care units. The publication of clear standards of practice within critical care and strong relationships within regional networks are potential reasons for the strong performance within the service. Feedback suggests that the new approach represents a significant improvement on previous CQC processes. CQC will continue to engage with clinical and patient experts within the inspection process to ensure credibility of inspection findings and as means to disseminate learning from an educationally rich experience. The CQC is looking for clinicians, including experts in critical care, to join their hospital inspections. If you work in critical care and would like to get involved, your knowledge and experience could help them arrive at expert judgments on critical care services, and would help your own professional development and learning. If you're interested in becoming a CQC specialist advisor, you can get in touch through the CQC website. On the 21st April 2015, the first edition of Guidelines for the Provision of Intensive Care Services (GPICS) was launched. GPICS was developed by the joint FICM/ICS Standards Committee with the support and endorsement of numerous organisations, including ICUsteps, and is intended as a definitive reference for delivery and development of intensive care medicine in the UK. 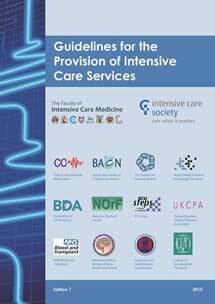 The publication of GPICS is intended as the first step towards building comprehensive standards and recommendations for the provision of intensive care in the UK. The first ICUsteps support group outside the United Kingdom opened in March 2015 with the formation of ICUsteps Dublin. I spent just under a month in hospital 2 years ago, 2 weeks of that in ICU on a ventilator. I was admitted with pneumonia and septicaemia. I found the experience to be terrifying. My physical recovery has been gradual but I don’t have the energy I used to, I suffer with back pain around my ribcage. My psychological recovery has been slower. I push myself to keep up for the sake of my husband and my two boys. I have been searching for support groups in Ireland as I feel somewhat isolated. I found your website to be most informative and I read some of the patient experiences. This lessened the isolation, it is hard for others to understand, the whole experience is quite surreal. My initial euphoria of having survived has been replaced with confusion as to how this happened to me, and it's hard to comprehend how I was at that time, I still haven’t come to terms with it. Barbara has worked tirelessly with the support of her family to highlight to healthcare professionals in Ireland the desperate need for support and rehabilitation following critical illness to help complete the patient journey and return us to the best possible quality of life. Her incredible journey reached new heights in October 2014 when she and husband Jimmy successfully completed the Dublin Marathon to raise start-up funds for ICUsteps Dublin. The group held its first drop-in on 11th March 2015. As with the original ICUsteps model, critical care nurses are providing healthcare professional involvement in the group voluntarily in their own time but in due course Barbara hopes to foster stronger official bonds between the group and the hospital that saved her life. NHS England’s public consultation on clinical commissioning closes at the end of April, but there’s still time to give your feedback if you hurry. The three month public consultation on the clinical commissioning of specialised services, including Adult Critical Care began at the end of January and is now drawing to a close. ICUsteps is represented on the Adult Critical Care Clinical Reference Group that developed the draft specification and NHS England would welcome healthcare professionals and the general public to give your feedback. The draft service specification for adult critical care services can be viewed on the NHS England website. Did you know that sepsis claims more lives than breast cancer, bowel cancer, prostate cancer and HIV/AIDS combined? The UK Sepsis Trust has made great strides to raise awareness of Sepsis and highlight the 37,000 lives it claims each year in the UK and in the next five years the trust aims to reduce this number by a third. ‘Sepsis Unplugged’ is the UK Sepsis Trust’s new conference which takes place at the East Midlands Conference Centre in Nottingham on 21–22 May 2015. The programme includes a wide range of sessions and workshops on improving identification, treatment and recovery from sepsis. Visit the conference website to view the full programme and to register. 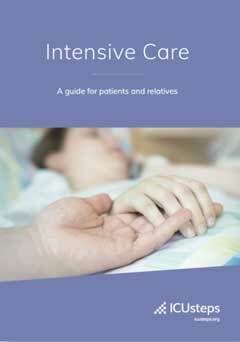 We knew there was a desperate need for better critical illness patient information when we first produced ‘Intensive Care: a guide for patients and relatives’ back in 2008. The original print run of 10,000 copies was snapped up and showed that a wider audience shared our belief. In the UK, 184 hospitals have ordered the booklet, with 128,000 copies dispatched since that first edition. To make it more widely accessible, we’ve translated it and this vital patient information is now available in 15 different languages, all of which are available as PDF downloads from our website. Healthcare professionals around the world have been inspired to adapt the booklet for their own country’s healthcare system too. The guide has now been adapted for use in thirteen countries across the world, including the United States, Australia, Colombia and eight European countries. The printed version is available in English and you can order these online with prices starting from just 32p. If you’d like to see a copy before you order, send us an email and we’ll be happy to send you a free copy. Can you help make it 16 languages? We’re always looking to make this information more widely available so if you’re fluent in a language that we don’t already have a translation for and you’d like to help, send us an email.